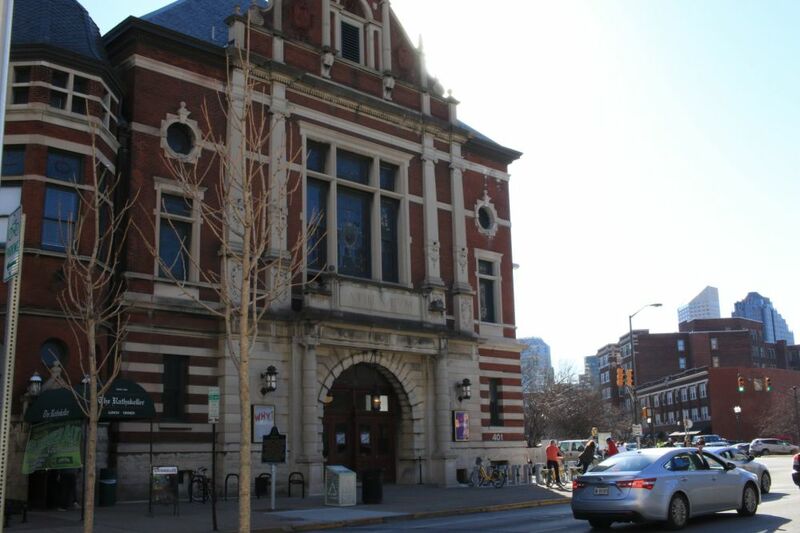 One of Indy’s most revered architectural wonders and cultural destinations, The Athenaeum is home to a number of performance and exhibition spaces, from the Biergarten outside to various niches and stages inside. The premier space, however, where American Cabaret Theatre held fort for many years, is a vast and impressive auditorium, somehow both grand and intimate at the same time. It is now a host to various theater performances, along with musical acts and other festivities. Now that the Athenaeum’s Coat Check Coffee has become just about the only coffeehouse downtown—aside from Starbucks—to get your caffeine fix due to recent closures, you have no excuse not to check out the art in Athenaeum Art Space just upstairs from the espresso machines. You may have seen the street-art-inspired paintings of Gary Gee depicted on billboards as part of the Arts Council of Indianapolis’ High Art Program. But if you’ve been a regular patron at the Art Space, you would’ve seen his work there first. Is there any reason to go on living, now that the race is over? Yes, grasshopper, Indy does live on culturally, in fact it flourishes, especially on First Friday. This month's First Friday was a typically rich and wondrous experience, starting with NUVO's annual Cultural Vision Awards ceremony. Comedian Jon Lajoie may be immature, selfish, and misogynistic, but his show at the Athenaeum last week proved, once again, that he's also very, very funny. Jobs With Justice supports workers in a multitude of ways, including protesting anti-union legislation and fighting for labor rights. Bicycle Garage Indy is devoted to spreading the economic, environmental and health benefits of utilizing bicycles for exercise and commutes. Celebrated local artist Lois Main Templeton is the 2011 CVA Lifetime Achievement recipient for her contribution to Indiana arts. The Center for Inquiry magnet schools offer an alternative education style for children in the Indianapolis Public School System. Through its residency program, the Indianapolis Symphony Orchestra has given gifted young musicians Time for Three an artistic home and training ground. Korin cultivates Indianapolis's cultural scene through the firm's involvement with local artists and museums. Starting the health food trend in Indianapolis ahead of the curve, Good Earth Natural Foods has become a neighborhood mainstay of wellness in Broad Ripple Village. Primary Colours is an artists collective devoted to reaching a broader audience than traditional galleries to help support young, local artists. ComedySportz Indianapolis will play host to this year's ComedySportz World Championship, a competitive event with side-splitting, family-friendly fun. After a week spent learning instruments and writing music, 14 bands worth of Girls Rock! campers performed to a packed house at The Athenaeum Friday. A series of public talks will explore the irony of lingering alcohol regulations. Indy's top burlesque troupes - Creme de les Femmes, Angel Burlesque and Bottoms Up Burlesque - outdo themselves with their history of burlesque through the ages. event at the Athenaeum ArtSpace to raise funds for 20 local nonprofit causes. Indy's most innovative social entrepreneurs will gather at 7 p.m. tonight at the Athenaeum to give four-minute elevator speeches. Open networking follows. The best day of the month is here, and we've got our picks for the must-sees on your First Friday gallery tour, plus a few bonus recommendations! NUVO is proud to announce this year's CVA winners. Jim Lehrer understands the Hoosier State much better than most Plains-state-bred intellects beached in D.C. Reading Kurt Vonnegut provided that connection. There's a lot to do in Indy tonight, and - as of today - it's all smoke free. See our favorites here. Will concerts in the Rathskeller Biergarten continue? Read the official statements from both organizations here. Bob Harbin's brilliant directorial choices make for a successful take on the Kander and Ebb classic. The keynote speaker at an Oct. 25 fundraiser for Exodus Refugee International chats with us about the struggle for democracy in Burma and his years as a political prisoner. Bobdirex head Bob Harbin talks about his company - and his company talks about him - on the eve of an all-star production of Monty Python's Spamalot.